Mustang is an isolated - and free - Tibetan kingdom whose people believe the Earth is flat, that illness is caused by evil spirits, and where women can have more than one husband. The Twin Otter hurtles through the narrow gap formed by the world's deepest gorge, hemmed in by two of the Himalayas' highest snow mountains, Nilgiri and Dhaulagiri. Like Alice in Wonderland's magic tunnel, on the far side of the mountain passage is a forbidding place called Mustang, caught in a medieval time warp and ruled by a storybook king. Mustang's 2000 square kilometres (about the size of greater Melbourne) thrust like a thumb into the great belly of Tibet. Its 7000 inhabitants are Tibetan and live much as Tibetans have for centuries. Since China invaded Tibet in 1950, the new rulers have banned many of the ancient ways and destroyed much of the unique culture. So, Mustang is a living museum. According to the Dalai Lama, the kingdom "is one of the few places in the Himalayan region that has been able to retain its traditional Tibetan culture unmolested". Most people in Mustang still believe the world is flat, and monks heal diseases with exorcisms. There are no roads, cars, telephones, televisions or Western doctors. Honouring an ancient Tibetan custom, a woman can marry several brothers at the same time. A high wind bangs against the fuselage, buffeting the small plane from side to side. A few minutes later, a snow massif pitched at a crazy angle fills the window. We career along its edge, so close that the slopes rush by at a terrifying speed. Then the plane dives steeply towards a dirt airstrip beside the Nepalese mountain village of Jomsom, on the edge of Mustang. It looks as if we have landed on the moon. Mountains stretch to the horizon, their steep, rugged slopes drained of moisture. There's not a blade of grass, not a single tree; just high ridges and peaks of dark rock tormented into menacing shapes by centuries of daily sandstorms. Shielding my face from the sting of flying sand, I mount a tough Tibetan pony for the five-day journey through Mustang's mountain passes, the only way to reach the capital, Lo Manthang. "Until 1991, the king forbade outsiders to enter Mustang, and he still only allows 1000 visitors a year,' says Jangbu Sherpa, my guide. Shadowed by deserted castles and forts perched on the barren peaks, at midday we reach the first village, Chuksang, 2900 metres above sea level. Mud huts fly prayer flags in the stiff breeze. Tall, dark-skinned women with sturdy limbs and wind-scoured faces, Tibetans all, spill out of the huts to greet us. They wear necklaces of orange corraline and turquoise, and have pinned pictures of the Dalai Lama to their chubas, dark home-spun robes bound with rainbow-striped aprons. Just 24km north across the mountains is Tibet, where the Chinese have made it a crime to possess a picture of the Dalai Lama. Late in the day, I encounter more evidence of the sometimes tense link between tiny Mustang and giant China. Climbing high into the mottled primrose canyons, we reach the village of Samar, 3500m above sea level. Soaring over barley fields, whitewashed houses and blood-red cliffs is a snow mountain, its jagged summit gleaming in the dying sunlight. Jangbu leads me into a two-storey mud-brick house, the inner walls surrounding an open court-yard, a stable for the family's ponies. The owner, Tashi Tamden, offers cups of oily Tibetan tea laced with salt and yak butter, a staple of the Mustang diet. He points out the window to a grassy slope: "We call it 'soldier hill' because that is where the Khampa had their magar, or war camp." THE LAST TIBETAN WARRIORS to defy the Chinese Army, the long-haired Khampa - known, for their ferocity - shielded the Dalai Lama as he fled to India in 1959. More than 6000 Khampa then set up bases in Mustang from where they slipped across the border to ambush Chinese troops. The CIA nurtured the Khampa, secretly flying many of them to a US army base in Colorado to learn modern guerilla warfare. However, following president Richard Nixon's historic visit to Beijing in 1972, the US buckled to strong pressure from China and abandoned the Khampa. The Dalai Lama sent a tape-recording calling on them to lay down their arms and leave Mustang. Nepalese Army Gurkhas slaughtered those who resisted. Mustang's king can muster little more than muskets and bows and arrows, so why has China tolerated this prickly neighbour along one of the world's most strategic borders? "China's friendship with Nepal protects Mustang from retaliation," says Tashi. In 1789, assailed by Gurkha troops, Mustang's monarch signed a treaty acknowledging the King of Nepal as his overlord. Mustang retained considerable autonomy but in 1950, following China's invasion of Tibet, Nepal responded to Mustang's king's pleas for protection by officially declaring it part of its territory. Two years ago, Mustang's king again tested Chinese tolerance when he allowed one of Tibet's most important lamas, the 15-year-old Karmapa, head of the powerful black-hat Kagyur sect, to use Mustang in a dramatic escape that made world headlines. On reaching sanctuary in northern India, the Karmapa revealed that he had secretly crossed from Tibet into Mustang and fled on foot and horseback through the kingdom. "This path was extremely difficult and exhausting due to the poor and often dangerous condition of the paths and the freezing cold weather," he said. I know what he means. With the icy cold biting our faces, the next morning we begin a harrowing journey, edging up cliff faces along steep, narrow, rocky staircases, reaching passes more than 4200m above sea level. We then stumble down equally dangerous pathways into ravines, to be confronted by more oxygen-starved passes looming overhead. Three days later we reach Tsarang, Mustang's second-largest town. A medieval castle nestles against a 15th century monastery, and whitewashed houses fortified by stone walls spread out in patterns across the barren valley. In the monastery, maroon-robed lamas huddle over low tables chanting Buddhist Scriptures marked on gold-leaf strips as a pair of child monks serve them fortifying yak-butter tea. More child monks sit cross-legged in the shadows. "Families are expected to give up their second-born sons to the monasteries when they are six or seven years old," Jangbu whispers. A teenaged monk leads me into the darkened Gonkhang ('the Room of the Protectors'), lined with ancient cutlasses. A life-sized stick man wears a Devil's mask and an ancient suit of Tibetan chain mail. The nightmarish creature brandishes a broad-sword with a grinning silver skull as its handguard. "The Gods sent us these weapons long ago in case we are attacked," says the monk. He smiles when I suggest that the creature might frighten me, but not the Chinese People's Liberation Army. THE FOLLOWING AFTERNOON, A DUST-STAINED rider, a tall, stocky man with braided hair rolled into a bun, Tibetan-style, and a turquoise stud in his car, gallops into Tsarang. It is Jigme Palbar Bista, Mustang's 69-year-old monarch. The 25th direct descendant of Ame Pal, a Tibetan warlord who united the kingdom in 1420, he dismounts and strides up the staircase to his sister's house. The king meets me inside a room overlooking the inner courtyard where his pony is stabled. He sits on an elevated bench covered with red carpet. On the walls hang paintings of the Buddha, and a dozen butter candies in silver bowls throw a feeble glow across the room. As a young man, the king studied in Shigatse, western Tibet, where he fell in love with and married a young noblewoman. Mustang's kings traditionally married high-born Tibetans. China's invasion, he says, "saddened me very much" He was in Shigatse in the mid-'50s and saw at first hand the cultural destruction: "The Chinese should leave Tibet, and the Dalai Lama should return to rule." These are brave words so close to the Chinese border, even if his kingdom enjoys the protection of Nepal. The king must know, though, that China will never quit its strategic bulwark. A more immediate worry is that Mustang is one of the world's poorest places. "Would you throw open Mustang's borders to unrestricted travel, knowing it could bring hundreds of jobs for your impoverished people?" I ask. The king shakes his head. "I would prefer a little less than the 1000 visitors a year who now come," he replies. "That way we can keep our culture intact." He sees modern ways at full force on visits to Kathmandu, especially the effect of violent videos on children, the juvenile delinquency he believes they cause, and the upsurge in street children. "I do not want that to happen in Mustang," he says. The next morning, a gale-force sandstorm blows in from Tibet. At midday, as we reach the top of a high pass, Jangbu points to a walled city below. "Lo Manthang!" he cries. The legendary Mustang castle city, at 3770rn above sea level, nestles in a rocky plain, its 300rn-long red battlements surrounded by barren mountains. 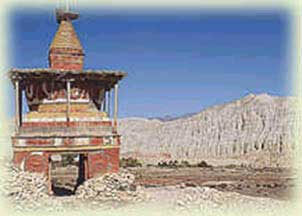 Mustang lies in the rain shadow of the Annapurna range and most of it is desert. Dominating the ancient fortress are several maroon monasteries and the whitewashed palace. At the city gates, old men in dirt-stiffened chubas and up-turned boots lounge by a tall, bronze prayer wheel. Rajendra Bista, a slim, mustachioed nobleman in his mid-thirties, leads me through winding, dusty alleyways, dodging child monks and black-eyed girls in long, dark cloaks herding goats to pasture outside the walls. He points to the ghost traps - goat skulls painted with powerful charms, fixed above the doors of the houses. "Hungry ghosts and demons are everywhere, in the streets, fields, air. The goat skull charms bar their entry into the homes," he whispers. I have come to Lo Manthang to witness the annual exorcism of demons from the city, but now Rajendra takes me to witness one of Mustang's most unusual Tibetan customs: polyandry. We climb a tree-trunk ladder to the home of the Tenjok Gurung family. As in every Mustang home, a pot suspended over an ever-burning fire bubbles with butter tea. Pema, the wife, is wiry, 30 years of age, but looks a decade older. She and the Tenjok brothers married in a joint ceremony ten years earlier with their parents' blessings. Thirty-five-year old Tashi the elder brother, is a pony herder, and Tse Cheeme, three years younger, makes clay bricks. "In Mustang, the fertile land is scarce, and if each brother married a wife, the family land would be divided, making us poor," says Tashi. "By sharing a wife, we keep the family strong." Each brother spends three nights in a row with Pema, and no-one knows who is the true father of their two children. "This doesn't bother us, we are all one family," Pema says. THE NEXT MORNING, RAJENDRA LEADS ME UP steep stone stairs to the clinic of Lama Tashi Tenzing, the king's physician, one of two amchis, or traditional doctors, in Lo Manthang. Mustang has no Western doctors; average life expectancy is about 50 years, with lung infection being the main killer. The amchis practise traditional Tibetan medicine, which is more than 2000 years old. The 33-year-old Lama began studying medicine at 11 with his father, a famous Tibetan healer. "He taught me that the body is a microcosm of the universe, made up of the five basic elements - earth, fire, water, air and space. Tension between the elements is the major cause of disease." Lining a wall are bottles of healing herbs, dried frogs, deer hair, iron ore and saltpetre. Rajendra is being treated for a recurring headache and the amchi reverts to a cure not seen in Western medicine for more than a century. "There's good blood and bad blood, and there are 72 kinds of bad blood we take out from the body," explains Lama Tashi. Using a P-shaped blade, he nicks a vein on the nobleman's arm and fills a silver cup with the blood. "I've removed the bad blood from the arm because it causes illness above the waist," he explains. "For sickness from the waist to the feet, I take bad blood from a vein in the ankle." When even that fails, the amchi believes the illness is caused by one of 1080 demons, or dus, which invade the body to cause the 404 known diseases in humans. Then the amchi makes out a prayer prescription for a fellow Lama to chant, beseeching one of the eight medical gods to vanquish the demon. The Lama is also a famed religious scholar who disputes the evidence that the Earth is round. "The Tibetan way teaches that the world is flat, with Lhasa at Its centre," he says. Mustang's schools are mostly staffed by Nepalis who instruct their pupils that the Earth is truly round. Schoolteacher Rajendra accepts this snippet of modern science, but he and Most Mustangis object to Nepal's heavy-handed cultural imperialism. Only the national language is used in the schools, with lesson's in Tibetan, Mustang's lingua franca, banned. At the annual school concert we watch the pupils perform dances and songs exclusively from Nepal's other ethnic groups. "Kathmandu says this strengthens national unity, and we accept this as the lesser of two evils," Rajendra tells me. "If not Nepal, then China, and we all know what that means." The following morning I edge past a growling Tibetan mastiff guard dog at the palace gate to visit the Queen of Mustang. She sits with a tiny Tibetan dog, a Lhasa apso, cradled on her lap. The queen has fine-boned aristocratic features, her beauty turned all the more poignant by the saddest eyes. Her only child, a boy, died at the age of eight. A Lama whispers that the child's death was caused by a chest disease. "I brought her so far from her home and she would hurt so," the king once explained to a visitor, telling why, on learning that the queen could not have any more children, he refused to take another wife and sire an heir to the Mustang throne. He chose his nephew to succeed him instead. The crown prince, Jigme Singi Palbar Bista, is in his mid-forties and lives in Kathmandu, running the royal family's carpet factory and travel company. Many in Mustang fear the aftermath of the king's death. "We worry that the new king will mostly stay in Kathmandu," says nobleman Rajendra. "The monarchy itself might then be challenged." On departure day, my pony climbs the steep pass overlooking the castle city. Five days later, as I ride out of the gorge, a fierce sand-storm suddenly sweeps down from the mountains overlooking Tibet. It blasts into my face at more than 150km/h, almost throwing me from the saddle. As I struggle against the wind to turn and look at Mustang for a final time, the sand swallows up this mysterious, forbidding place. At that moment I am reminded of my meeting with Mustang's king. As he draped a kata, a traditional Tibetan silk scarf, around my neck in farewell, he said, "We welcome visitors from the outside world, but not too many."